Ways to Earn Free Gift Cards! Shhh…. Did you hear that? I could have sworn I heard jingle bells ringing! Either that or I have officially gone of the deep end thinking about how close Christmas is! I don’t know about you, but I start to panic right around Halloween just thinking about all of the gifts that I have to buy or make. I usually start Christmas shopping around summer, but with work and school, I just did not get any shopping done this year. To lesson the blow to my wallet I have been using various sites to earn free gift cards! I earn more with some sites than I do with others, but as I see it, every little bit helps. So, here are some of my favorite and easy ways that I am earning free gift cards. Bing – Yes, Bing! I love google, but once I learned I could earn gift cards via Bing, I made the switch. You earn gift cards just by searching the internet. They have other gift card options as well, but Amazon is my favorite and you can redeem with just 500 points. This may seem like a lot, but they rack up quickly. You can earn bonus points as well, which is a nice bonus. CardPool.com – What I love about Card Pool is that you can trade in gift cards that you already have on hand for gift cards that you will actually use! This is especially great after the holidays. I love getting gift cards from friends and family, but sometimes they are for places that I do not usually shop at. With Card Pool I can trade them in for some place I will actually shop at! Ebates – Since I do a majority of my shopping online, Ebates is my go to for online shopping! You can earn a free $10 gift card with your first $25 purchase using the site. They have thousands of retailers to choose from and you earn a percentage of your purchase back in cash! There are no forms to fill out, simply cash out and get a check or paypal cash! Swagbucks – Swagbucks is another favorite of mine. You have a ton of different ways to earn gift cards. From online shopping, to surveys and coupon redemption! They all add up pretty fast! InstaGC – The great thing about InstaGC is that you can redeem at just $1! You have a number of different ways to earn gift cards here as well, which is great! ShopKick – If you have a smartphone, ShopKick is a must have! Earn “Kicks” just by walking into your favorite store! You can earn additional kicks while in the store as well! Amazon Trade in – Do you have any old electronics laying around not being used? Why not trade them in for Amazon gift cards? They take cell phones, cameras and even calculators! The amount varies for items, but if you are not using it, why not cash it in! Viggle – Viggle is another smartphone app that I LOVE! You earn points just for watching TV or listening to music! All you do is open the app and let it listen to whatever you are watching or listening to and you get points! You can then redeem the points for gift cards or other swag. 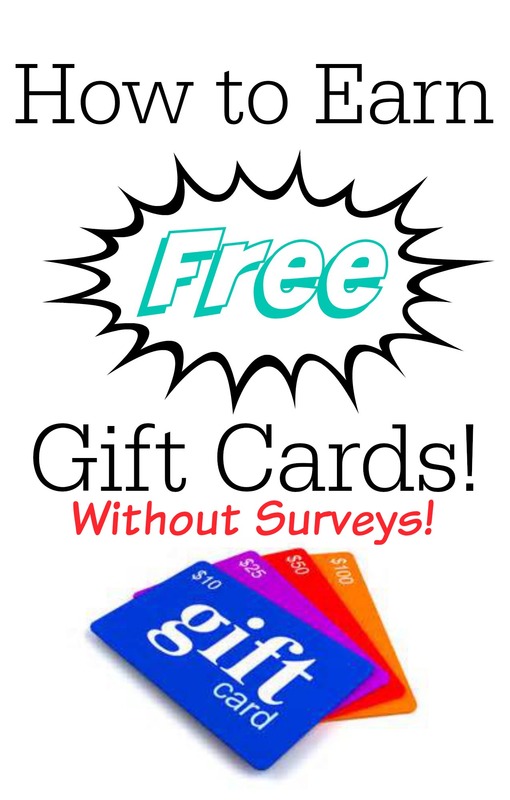 Do you have a favorite app or site that you earn free gift cards through? Previous Post: « DIY Fairy Ears!